Slow cooked, richly flavored Texas Chile is great for entertaining. 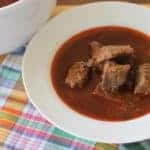 Lean chunks of tender beef is a flavorful sauce. That’s comfort food! In a small bowl combine chili powder, ancho chile pepper, crushed red pepper, cumin, oregano and flour. Set aside. Heat oil in 4-quart Dutch oven over medium heat. Add beef, stirring frequently, until the meat changes color but does not brown. Lower heat, stir in garlic, cook for 1 minute. Sprinkle meat with chili mixture, stirring until evenly coated. Hours, stirring occasionally. Add remaining broth. Cook 30 minutes more, or until meat is tender and falling apart. Finish with a squeeze of fresh lime juice over each bowl.